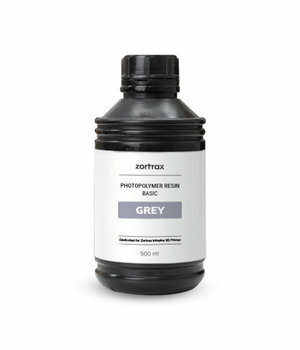 Zortrax Resin BASIC is an epoxy-based resin offering sharp edges, high detail, and short curing times. It’s durable and easy to print. It’s available in grey, white, and pigment free. Zortrax Resin BASIC contains no volatile organic compounds, so it is safe to print with when used in accordance with our safety instructions. The already cured resin is easy to paint. This resin has very low shrinkage. Its shore hardness is 82.2 D for the pigment-free version and as high as 88 D for ivory and grey versions. 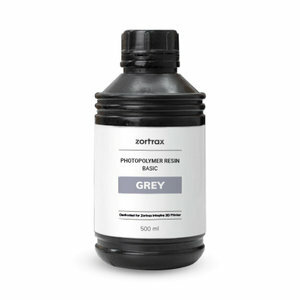 Due to its composition, Zortrax Resin BASIC offers smooth surfaces. It can be cured with UV light with 405 nm wavelength.